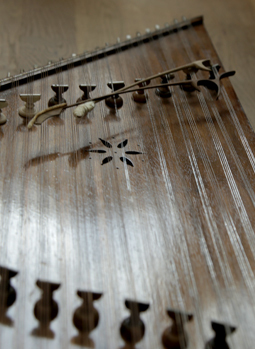 The santur is a hammered dulcimer with a trapezoid-shaped, wooden body. It is usually placed on the lap of the player who is sitting in a cross-legged position, striking the strings with a pair of wooden mallets or hammers. It consists of 72 metallic strings which are grouped in sets of four and stretched over the wooden bridges placed on the sound board. Each note of a group is tuned the same, so when striking them with the sticks, the resonance of the four strings creates the special sound character which is distinctive for the Santur. The santur was originally invented in the middle east in particular the Iran, Kuwait, Syria and Turkey. Each country customized and designed their own versions to adapt to their musical scales and tunings. Today you can say the santur has become the father of several metallic string instruments such as harpsichord, cimbalom and the American and European hammered dulcimers. In the history of our previous released string instruments we have again set a great focus on creating an instrument with an organic and realistic feel. In order to concentrate on the main instrument articulations, we have recorded the Santur in a regular „plucking“ articulation with a pair of Schoeps. We have beaten the metallic strings with two different kind of mallets in four times round robin and three velocity layer which is well suited for playing melodies but also offers many more uses. We have used a hard mallet that creates the typical bright, rather clear sound as well as a soft mallet which generates a more mellow, less aggressive timbre. The overall sound can be altered by determining the length of the notes, adding distortion or adjusting the high as well as the low frequencies. The possibility to choose between six different kinds of reverb and three delay times provides a great amount of freedom in colouring the sounds how you like. The Santur provides our - from Hammered Duclimer known - „Tremolo-Option“ which can be controlled in different ways. Generally the tremolo option is capable of creating a very tragic and dramatic but also extremely natural tremolo sound, which fits perfectly in a lot of different music styles and genres. The tromolo options works in two different modi: You can control the tremolo tempo and dynamic by the modwheel while holding the note or the notes where duplciated by releasing while you are playing. Both modi gives you the ability to exactly play your personal kind of the tremolo. 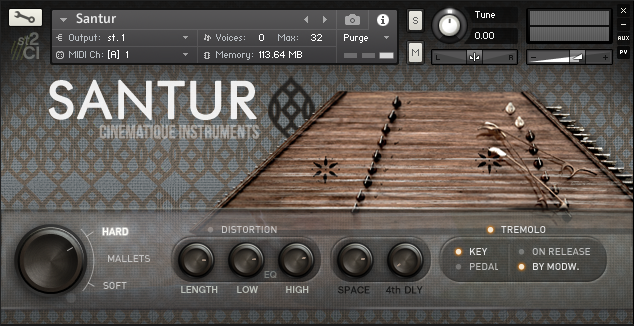 Altogether, the Santur is an extraordinary instrument with quite a lot of possibilites which you can use to add a special character to your music. One complex patch including two articulations and advanced scripting. Approx. data 0.9 GB data. For more details please read the reference manual. It shows a walk through the Santur.